The kids have gone south – but just for the winter and not before donning their Halloween costumes. After a successful first summer of Yoga with Goats, it is time for the crew and their four-legged friends to head to Florida for the winter. 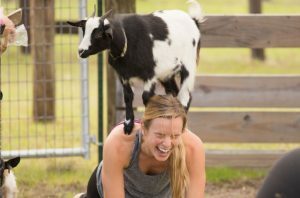 Great Rock Farm’s, Goats to Go, offered over 60 goat-yoga and snuggle events in Georgetown. Along with the regular yoga and snuggle sessions, Yoga with Goats did several special events including a fundraiser for the Miss Pink Pageant (http://misspinkpageant.com/), a non profit organization that celebrates the life of breast cancer survivors and the true beauty, courage and hope each possess, Trick or Treat yoga with kids and guests in costume, and a beer tasting/yoga class. 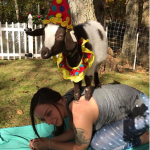 Goats to Go offers goat yoga and themed events, that are suitable for all levels and experiences. It is a one hour yoga session taught by a certified yoga instructor were they use 12-15 baby goats to aid in the therapeutic relief when practicing a gentle flow yoga in a natural farm setting. For those just wanting time with the goats, a snuggle class is offered where you learn more about the goats and life on the farm. All classes include a farm viewing, 30/40 minutes of gentle yoga or snuggle, and a 15 minute cool down seated poses while you continue to hold, pat, snap pictures, and feed goat treats. 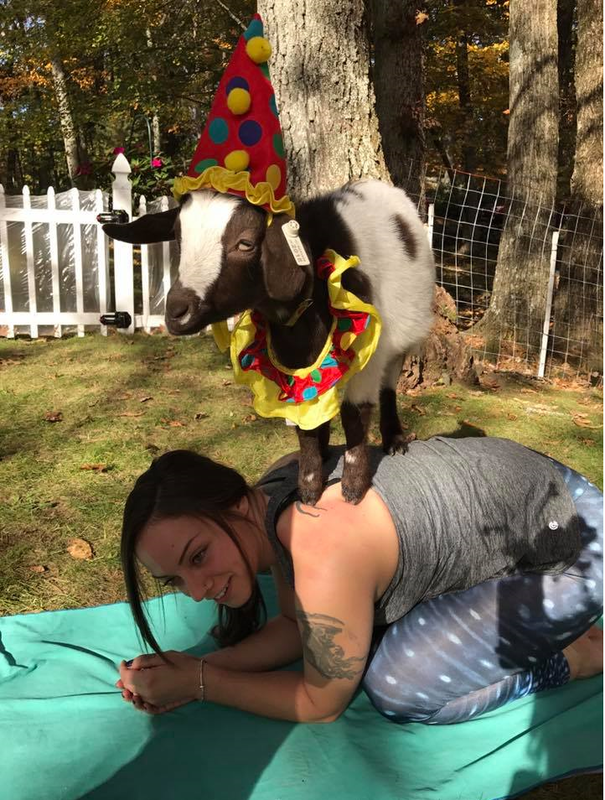 Aulson said the theory behind mixing yoga with kids is that “goat kids are just plain fun and curious creatures. It takes additional concentration to do your pose and be mindful of not only your neighbor, but also of the kid that may be lingering near you. Goats love to be playful and jump on things. It’s just what they do. So if a person is there, well, they jump and play on them. You can learn more about Yoga with Goats at www.GoatsToGo.farm or follow them on their Facebook Page.